We all know that the standard a player is measured against are the performances they make in big tournaments. That means Major Championships. Of the Top-10 players in the world coming into 2013, six of them have yet to win that elusive first Major Championship of their careers. Will this be the season that one of them does? The first names at the top of that list are Luke Donald and Lee Westwood. Of the two of them, Westwood has had the most opportunities squandered when it comes to winning a Major. He had multiple runner-up and third place finishes in all four of the Majors. But getting over the hump and into the winners circle has proven to be a much more difficult task. As for Donald, he has not had as much success in Majors, but had found that success everywhere else in the world, rising to the No.1 ranking in 2011 and for a lot of 2012. Oddsmakers have actually formed betting lines for Westwood and Donald to win their first Major Championship in the 2013 season. Bovada Sportsbook allows bettors to jump in on one of them winning zero, one, or multiple Majors on their Major Championship Prop Bets. Beginning with Westwood, the odds are not surprisingly stacked against him, with a payout at -800 that he will go Major-less in 2013 . One Major win isn’t far-fetched though, going off at +333, which is slightly over a 3/1 payout. Once we get into multiple Major championship territory in 2013, the odds skyrocket, all the way up to +30000 for the Grand Slam. For Donald, the odds are somewhat similar, but it is certainly noticeable that the -500 payout for no Majors is different than Westwood. But when you look at Donald’s odds to win one Major in 2013, it’s an equal +333. 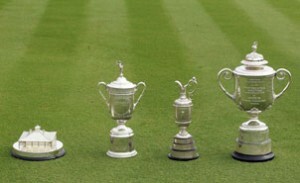 The rest of the outcomes miror Westwood as well, all the way to the Grand Slam. Outside of Westwood and Donald, we have No.5 Justin Rose, No.6 Adam Scott, No.8 Brandt Snedeker and No.10 Steve Stricker as the next players in line trying to beat down that Major Championship door. And when looking at it, all of those aforementioned players have big wins to their credit. That should go without saying though, as players don’t crack the top-10 without big performances. There are The PLAYERS Championship champions, FedEx Cup champions, and World Golf Championships champions among them. Scott had a six-shot lead going into the final nine holes of the British Open last year, but let that lead slip away from him. It’s not that difficult to figure out that the pressure to win a Major is unlike any other tournament on PGA Tour. The results prove that. The more a player puts themselves in that position though, the better chance they will have. This could be the season that one of the players mentioned could get their first Major Championship to their credit. This entry was posted in News and tagged adam scott, brandt snedeker, justin rose, lee westwood, luke donald, major championships golf, steve stricker, world golf rankings on January 21, 2013 by Bryan.